If you’ve ever passed a brick or stone wall outside a development or around a private home, there’s a good chance it wasn’t actually brick or stone. Many houses, developments and businesses build strong, long-lasting walls and fences using precast concrete fence. These fences offer all the advantages of a traditional privacy fence. Plus they also add the benefits of concrete’s strength and durability. Read on to learn more about this exceptional fencing product and why it could be right for you. So what exactly separates a precast fence from a wall? The idea of precast concrete fencing is confusing at first, to be sure. But there are some important differences between a concrete fence and a concrete wall. These differences set concrete fence apart from both wooden fences and concrete or stone walls. The chief difference between precast concrete fence and a concrete wall is thickness. While concrete walls are often a foot thick or more, a precast concrete fence is only a few inches in thickness. This has many benefits, the biggest being weight savings. A traditional concrete wall can weigh thousands of pounds for just a few feet of fence. In contrast, a precast concrete fence panel weighs less than 250 pounds for one 9-foot panel. This makes them much easier to transport and install. It also allows them to be placed on softer ground without issue. Along with thickness and weight, another important difference between precast fences and other fence types is strength. Concrete fences are extremely strong and durable. They stand up to weather and debris better than any other type of fence. A precast concrete fence is every bit as durable as a thicker concrete or brick wall. Finally, the last major difference between precast concrete fence and other fence types is cost. 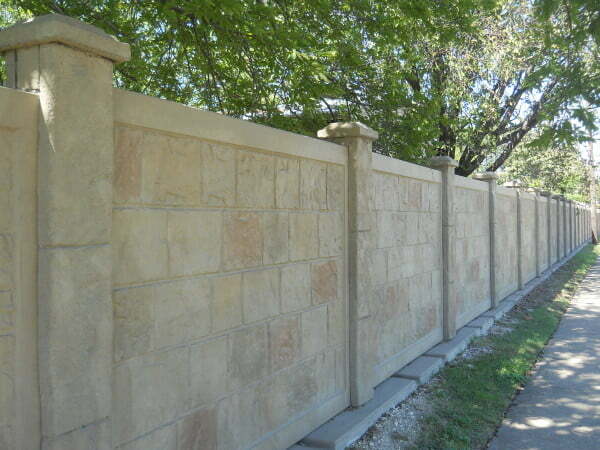 Precast concrete fence is much less expensive than a standard concrete or masonry wall. Often the costs are comparable to installing a well-made wood or vinyl fence. If you want the look and feel of stone without the price tag, precast concrete fence is perfect. Variety – One of the biggest benefits of working with precast concrete fence is its variety of colors to suit any home or style. You aren’t tied to the look of bare concrete. In fact, it can be hard to tell concrete fences aren’t made of actual stone until you examine the fence panel. Repairability – Unlike other types of concrete fence, our precast concrete fences are designed to be easy to repair. If your fence does suffer any damage, you can almost always repair it with a standard masonry patch. These patches are available at any hardware store. If serious damage occurs, you can order a new panel and install it in less than an hour. Seasonal Durability – You can never tell exactly what the weather will be like in North Texas. Fortunately a precast concrete fence isn’t affected at all by extreme temperatures. These concrete fences are freeze-thaw tested by the manufacturer. This ensures they aren’t damaged by cold temperatures. They are also heat-resistant and UV-stable. Finally, they can withstand wind loads of up to 140 miles per hour. This is about the same as an F3 tornado or a Category 4 hurricane. Environmental Friendliness – Another benefit of precast concrete fencing is it’s better for the environment than other types of fence or wall. More than 50% of the fence’s material is made from recycled substances. That makes the fence a great choice for environmentally conscious buyers. Maintenance-Free – Finally, precast concrete fences are virtually maintenance free. They need little to no seasonal upkeep. You’ll certainly appreciate this aspect over regularly treating and staining a wooden fence. Who Can Use a Precast Concrete Fence? Homes – Homeowners love the durability and the high-end appearance of precast concrete fencing. They also appreciate these fences come in colors to match their home or neighborhood. Businesses – Precast concrete fences are great for businesses. They’re extra secure and strong and do a lot to set your business apart from its surroundings. Developments and Properties – Precast fence makes a great border fence for developments, properties, and large tracts of land. Their low cost-per-foot makes them a more economical option than a stone wall. Yet they’re still much stronger and more durable than wooden fence. Want to learn more about our precast concrete fencing? Call (972) 576-1600 today to speak to us at Future Outdoors. We’re the number one fencing contractor in Dallas and the surrounding metro. Give us a call or visit our Facebook page to get more ideas and information for your fencing project.